Take your organization's security to a whole new level and ensure you and your clients' safety. Our line of micro cut shredders yields a smaller shred than strip or cross cut, reducing your information down to a mere particle. This line is available in everything from smaller personal use machines to industrial high capacity use units. Starting at a level 4 security level and higher, these shredders are nothing to mess around with. Additionally, you'll receive the backing of a great brand name including HSM, Destroyit, Fellowes, and more. Determine the needs for you or your organization and get started with the right unit today. Take a look at the selections available below. Welcome to MyBinding video. Security of sensitive information is one of the most important issues in our world today. 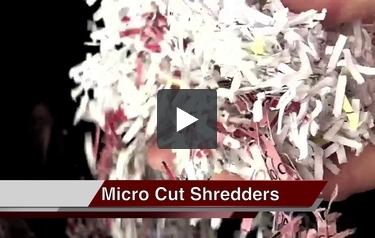 Micro cut shredders are machines that address that very issue. Here at MyBinding.com we have a number of document shredders that can shred at the micro cut level, rendering a security level of 4, 5 and even 6, governmental espionage proof. If you’re looking at micro cut shredders, you’re obviously thinking of security, but as you’re shopping around, think about the size of the machine and the workspace you’ll be using it in. You’ll want to think about your workload because micro shredders shred much slower than strip cut or cross cut just because the amount of work it has to do and they generally can’t shred as many sheets at one time. And you’ll want to keep in mind these machines make a lot of mess and work really hard so you’ll want to take care of them and have the right receptacles for cleanup. And our site has plenty of how-to videos in taking care of your shredders and providing for all of your supplies. And you can always give us a call. We’d love to help you find exactly what you need. For more demos, reviews and how-to’s, check out MyBinding.com.